Details of services and events during Holy Week can be found on the Holy Week 2019 Poster. We’re trying something different on the weekdays in Holy Week (15-19th April) this year. There will be “Stations of the Cross” throughout the church yard. The stations follow Jesus’ final journey through Jerusalem on the day of his crucifixion to his burial in the tomb and can be walked alone or if you prefer to do so with others (assuming someone else wants to come!) we will meet at 12 noon in the porch. Leaflets will be available in the porch with prayers & reflections if you can’t join us at 12. 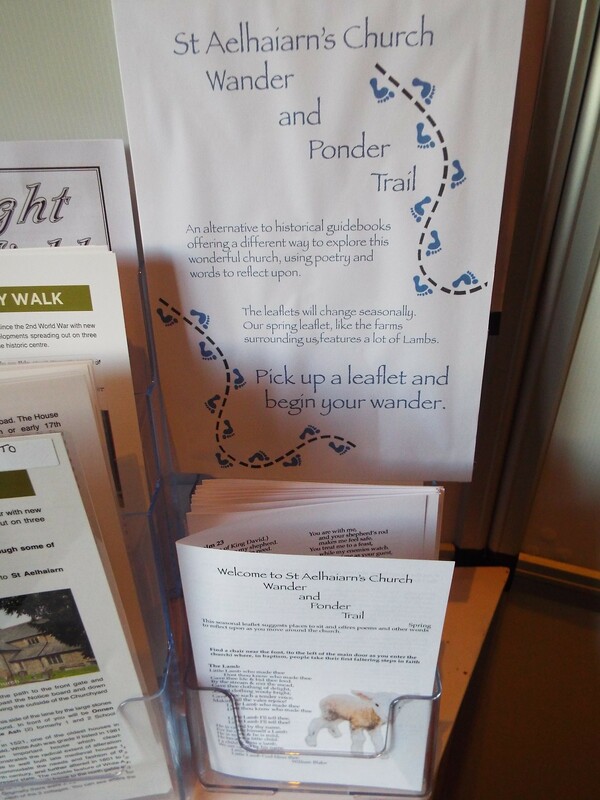 There is a new way to appreciate and learn about St Aelhaiarn’s Church; why not pick up a leaflet and follow the ‘Wander and Ponder’ Trail? As you wander around, you will see and find out a little bit more about the meaning and reasons for some of the items and images in the Church. The leaflets can be found on the table part of the notice board to the left of the door as you enter the Porch. The Trail will be changed several times during the year to feature different items and reflections; so, if you enjoy it, do look out for the new leaflets and come back again to enjoy the peace and serenity of our beautiful church. The new Mothers’ Union programme for 2019 has been issued see MU Programme 2019 for upcoming events and throughout the year. For the latest winners of the ‘250 Club’ draw please see the 250 Club Winners Jan 2019 list. Our Christmas collection for the Wrexham Respite Centre for the Homeless raised the wonderful sum of £625. Following the retirement of our long serving organist, we are looking for a successor who can commit to playing regularly for morning and evening services on Sundays and for major Christian festivals, with additional fees for weddings and funerals. For details please contact Caroline on 01938 554245. ‘Guilsfield Gets Together’ – New day and time! The Dementia Friendly Guilsfield monthly ‘Forget-Me-Not’ Café has been renamed ‘Guilsfield Gets Together’. There is now a new day and time; we will be holding the Guilsfield Gets Together on the first Friday of the month from 10:00am to 11:30 am. The next one is on Friday 5th April: see the cafe poster summer. Come along on the first Friday of the month for this opportunity to have a cup of team or coffee and meet up with friends and neighbours. All welcome; please do come along to the Old School and enjoy the cakes; £2 per person. Why not visit our new Facebook page at www.facebook.com/guilsfieldchurch and see the latest news, pictures and information about what has been happening at Guilsfield Church. The giving by Guilsfield Church in 2017 is summarized at Donations in 2017.